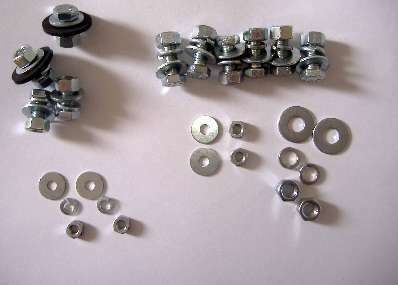 Front bumper Fastener Kit containing High Tensile Steel Bright Zinc Plate bolts (HB), Set Screws (HU), Rectangular Lock washers (WL), Square section Lock washers (WQ), Plain washers (WP), Nuts (HN), and rubber washers to fit Front bumper and number plate plinth to the car. Extra Nuts are included to cover for missing captive nuts. All sizes correct Imperial UNF. Proven fit. All items labelled for position. Coach Bolts for over-riders not included although washers and nuts are in the kit. We offer M10 Socket Head Stainless set screws for this position.